A radioisotope thermoelectric generator (RTG, RITEG) is an electrical generator that uses an array of thermocouples to convert the heat released by the decay of a suitable radioactive material into electricity by the Seebeck effect. This generator has no moving parts. RTGs have been used as power sources in satellites, space probes, and unmanned remote facilities such as a series of lighthouses built by the former Soviet Union inside the Arctic Circle. RTGs are usually the most desirable power source for unmaintained situations that need a few hundred watts (or less) of power for durations too long for fuel cells, batteries, or generators to provide economically, and in places where solar cells are not practical. Safe use of RTGs requires containment of the radioisotopes long after the productive life of the unit. Notably, RTGs tend to be prohibitively expensive for most things they might otherwise find applications for. A pellet of 238PuO2 as used in the RTG for the Cassini and Galileo missions. This photo was taken after insulating the pellet under a graphite blanket for several minutes and then removing the blanket. 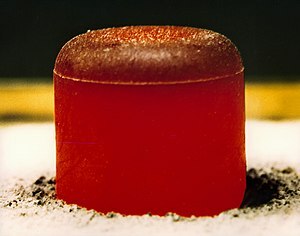 The pellet is glowing red hot because of the heat generated by radioactive decay (primarily α). The initial output is 62 watts. The RTG was invented in 1954 by Mound Laboratories scientists Ken Jordan and John Birden. They were inducted into the National Inventors Hall of Fame in 2013. Jordan and Birden worked on an Army Signal Corps contract (R-65-8- 998 11-SC-03-91) beginning on January 1, 1957, to conduct research on radioactive materials and thermocouples suitable for the direct conversion of heat to electrical energy using polonium-210 as the heat source. RTGs were developed in the US during the late 1950s by Mound Laboratories in Miamisburg, Ohio, under contract with the United States Atomic Energy Commission. The project was led by Dr. Bertram C. Blanke. The first RTG launched into space by the United States was SNAP 3B in 1961 powered by 96 grams of plutonium-238 metal, aboard the Navy Transit 4A spacecraft. One of the first terrestrial uses of RTGs was in 1966 by the US Navy at uninhabited Fairway Rock in Alaska. RTGs were used at that site until 1995. A common RTG application is spacecraft power supply. Systems for Nuclear Auxiliary Power (SNAP) units were used for probes that traveled far from the Sun rendering solar panels impractical. As such, they were used with Pioneer 10, Pioneer 11, Voyager 1, Voyager 2, Galileo, Ulysses, Cassini, New Horizons and the Mars Science Laboratory. 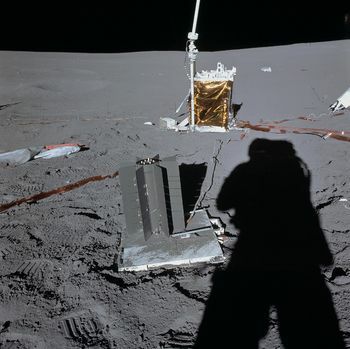 RTGs were used to power the two Viking landers and for the scientific experiments left on the Moon by the crews of Apollo 12 through 17 (SNAP 27s). Because the Apollo 13 moon landing was aborted, its RTG rests in the South Pacific Ocean, in the vicinity of the Tonga Trench. RTGs were also used for the Nimbus, Transit and LES satellites. By comparison, only a few space vehicles have been launched using full-fledged nuclear reactors: the Soviet RORSAT series and the American SNAP-10A. In addition to spacecraft, the Soviet Union constructed many unmanned lighthouses and navigation beacons powered by RTGs. Powered by strontium-90 (90Sr) (a material with potential use in a "dirty bomb") they are very reliable and provide a steady source of power. Most have no protection, not even fences or warning signs, and the locations of some of these facilities are no longer known due to poor record keeping. In one instance, the radioactive compartments were opened by a thief. In another case, three woodsmen in Tsalendzhikha Region, Georgia found two ceramic RTG heat sources that had been stripped of their shielding; two of them were later hospitalized with severe radiation burns after carrying the sources on their backs. The units were eventually recovered and isolated. There are approximately 1,000 such RTGs in Russia, all of which have long since exceeded their design operational lives of ten years. Most of these RTGs likely no longer function, and may need to be dismantled. Some of their metal casings have been stripped by metal hunters, despite the risk of radioactive contamination. The United States Air Force uses RTGs to power remote sensing stations for Top-ROCC and SEEK IGLOO radar systems predominantly located in Alaska. In the past, small "plutonium cells" (very small 238Pu-powered RTGs) were used in implanted heart pacemakers to ensure a very long "battery life". As of 2004[update], about ninety were still in use. By the end of 2007, the number was reported to be down to just nine. The Mound Laboratory Cardiac Pacemaker program began on June 1, 1966, in conjunction with NUMEC. When it was recognized that the heat source would not remain intact during cremation, the program was cancelled in 1972 because there was no way to completely ensure that the units would not be cremated with their users' bodies. The design of an RTG is simple by the standards of nuclear technology: the main component is a sturdy container of a radioactive material (the fuel). Thermocouples are placed in the walls of the container, with the outer end of each thermocouple connected to a heat sink. Radioactive decay of the fuel produces heat. It is the temperature difference between the fuel and the heat sink that allows the thermocouples to generate electricity. A thermocouple is a thermoelectric device that can convert thermal energy directly into electrical energy, using the Seebeck effect. It is made of two kinds of metal (or semiconductors) that can both conduct electricity. They are connected to each other in a closed loop. If the two junctions are at different temperatures, an electric current will flow in the loop. Its half-life must be long enough so that it will release energy at a relatively constant rate for a reasonable amount of time. The amount of energy released per time (power) of a given quantity is inversely proportional to half-life. An isotope with twice the half-life and the same energy per decay will release power at half the rate per mole. Typical half-lives for radioisotopes used in RTGs are therefore several decades, although isotopes with shorter half-lives could be used for specialized applications. For spaceflight use, the fuel must produce a large amount of power per mass and volume (density). Density and weight are not as important for terrestrial use, unless there are size restrictions. The decay energy can be calculated if the energy of radioactive radiation or the mass loss before and after radioactive decay is known. Energy release per decay is proportional to power production per mole. Alpha decays in general release about ten times as much energy as the beta decay of strontium-90 or caesium-137. Radiation must be of a type easily absorbed and transformed into thermal radiation, preferably alpha radiation. Beta radiation can emit considerable gamma/X-ray radiation through bremsstrahlung secondary radiation production and therefore requires heavy shielding. Isotopes must not produce significant amounts of gamma, neutron radiation or penetrating radiation in general through other decay modes or decay chain products. The first two criteria limit the number of possible fuels to fewer than thirty atomic isotopes within the entire table of nuclides. Plutonium-238, curium-244 and strontium-90 are the most often cited candidate isotopes, but other isotopes such as polonium-210, promethium-147, caesium-137, cerium-144, ruthenium-106, cobalt-60, curium-242, americium-241 and thulium isotopes have also been studied. Plutonium-238 has a half-life of 87.7 years, reasonable power density of 0.54 watts per gram, and exceptionally low gamma and neutron radiation levels. 238Pu has the lowest shielding requirements. Only three candidate isotopes meet the last criterion (not all are listed above) and need less than 25 mm of lead shielding to block the radiation. 238Pu (the best of these three) needs less than 2.5 mm, and in many cases, no shielding is needed in a 238Pu RTG, as the casing itself is adequate. 238Pu has become the most widely used fuel for RTGs, in the form of plutonium(IV) oxide (PuO2). However, plutonium(IV) oxide containing a natural abundance of oxygen emits ~23x103 n/sec/g of plutonium-238. This emission rate is relatively high compared to the neutron emission rate of plutonium-238 metal. The metal containing no light element impurities emits ~2.8x103 n/sec/g of plutonium-238. These neutrons are produced by the spontaneous fission of plutonium-238. The difference in the emission rates of the metal and the oxide is due mainly to the alpha, neutron reaction with the oxygen-18 and oxygen-17 present in the oxide. The normal amount of oxygen-18 present in the natural form is 0.204% while that of oxygen-17 is 0.037%. The reduction of the oxygen-17 and oxygen-18 present in plutonium dioxide will result in a much lower neutron emission rate for the oxide; this can be accomplished by a gas phase 16O2 exchange method. Regular production batches of 238PuO2 particles precipitated as a hydroxide were used to show that large production batches could be effectively 16O2-exchanged on a routine basis. High-fired 238PuO2 microspheres were successfully 16O2-exchanged showing that an exchange will take place regardless of the previous heat treatment history of the 238PuO2. This lowering of the neutron emission rate of PuO2 containing normal oxygen by a factor of five was discovered during the cardiac pacemaker research at Mound Laboratory in 1966, due in part to the Mound Laboratory's experience with production of stable isotopes beginning in 1960. For production of the large heat sources the shielding required would have been prohibitive without this process. Unlike the other three isotopes discussed in this section, 238Pu must be specifically synthesized and is not abundant as a nuclear waste product. At present only Russia has maintained consistent 238Pu production[dubious – discuss], while in the US, no more than 50 g (1.8 oz) were produced in total between 2013 and 2018. The US agencies involved desire to begin the production of the material at a rate of 300 to 400 grams (11 to 14 oz) per year. If this plan is funded, the goal would be to set up automation and scale-up processes in order to produce an average of 1.5 kg (3.3 lb) per year by 2025. Strontium-90 has been used by the Soviet Union in terrestrial RTGs. 90Sr decays by β emission, with minor γ emission. While its half life of 28.8 years is much shorter than that of 238Pu, it also has a lower decay energy with a power density of 0.46 watts per gram. Because the energy output is lower it reaches lower temperatures than 238Pu, which results in lower RTG efficiency. 90Sr is a high yield waste product of nuclear fission and is available in large quantities at a low price. Some prototype RTGs, first built in 1958 by the US Atomic Energy Commission, have used polonium-210. This isotope provides phenomenal power density (pure 210Po emits 140 W/g) because of its high decay rate, but has limited use because of its very short half-life of 138 days. A half-gram sample of 210Po reaches temperatures of over 500 °C (900 °F). As Po-210 is a pure alpha-emitter and does not emit significant gamma radiation or X-ray, the shielding requirements is also low as for Pu-238. Americium-241 is a potential candidate isotope with a longer half-life than 238Pu: 241Am has a half-life of 432 years and could hypothetically power a device for centuries. However, the power density of 241Am is only 1/4 that of 238Pu, and 241Am produces more penetrating radiation through decay chain products than 238Pu and needs more shielding. Its shielding requirements in a RTG are the third lowest: only 238Pu and 210Po require less. With a current global shortage of 238Pu, 241Am is being studied as RTG fuel by ESA. An advantage over 238Pu is that it is produced as nuclear waste and is nearly isotopically pure. Prototype designs of 241Am RTGs expect 2-2.2 We/kg for 5-50 We RTGs design, putting 241Am RTGs at parity with 238Pu RTGs within that power range. 90Sr-powered Soviet RTGs in dilapidated condition. Most RTGs use 238Pu, which decays with a half-life of 87.7 years. RTGs using this material will therefore diminish in power output by a factor of 1−0.51/87.74, or 0.787%, per year. One example is the RTG used by the Voyager probes. In the year 2000, 23 years after production, the radioactive material inside the RTG had decreased in power by 16.6%, i.e. providing 83.4% of its initial output; starting with a capacity of 470 W, after this length of time it would have a capacity of only 392 W. A related loss of power in the Voyager RTGs is the degrading properties of the bi-metallic thermocouples used to convert thermal energy into electrical energy; the RTGs were working at about 67% of their total original capacity instead of the expected 83.4%. By the beginning of 2001, the power generated by the Voyager RTGs had dropped to 315 W for Voyager 1 and to 319 W for Voyager 2. NASA is developing a Multi-Mission Radioisotope Thermoelectric Generator in which the thermocouples would be made of skutterudite, a cobalt arsenide (CoAs3), which can function with a smaller temperature difference than the current tellurium-based designs. This would mean that an otherwise similar RTG would generate 25% more power at the beginning of a mission and at least 50% more after seventeen years. NASA hopes to use the design on the next New Frontiers mission. RTGs use thermoelectric generators to convert heat from the radioactive material into electricity. Thermoelectric modules, though very reliable and long-lasting, are very inefficient; efficiencies above 10% have never been achieved and most RTGs have efficiencies between 3–7%. Thermoelectric materials in space missions to date have included silicon–germanium alloys, lead telluride and tellurides of antimony, germanium and silver (TAGS). Studies have been done on improving efficiency by using other technologies to generate electricity from heat. Achieving higher efficiency would mean less radioactive fuel is needed to produce the same amount of power, and therefore a lighter overall weight for the generator. This is a critically important factor in spaceflight launch cost considerations. A thermionic converter—an energy conversion device which relies on the principle of thermionic emission—can achieve efficiencies between 10–20%, but requires higher temperatures than those at which standard RTGs run. Some prototype 210Po RTGs have used thermionics, and potentially other extremely radioactive isotopes could also provide power by this means, but short half-lives make these unfeasible. Several space-bound nuclear reactors have used thermionics, but nuclear reactors are usually too heavy to use on most space probes. Thermophotovoltaic cells work by the same principles as a photovoltaic cell, except that they convert infrared light emitted by a hot surface rather than visible light into electricity. Thermophotovoltaic cells have an efficiency slightly higher than thermoelectric modules (TEMs) and can be overlaid on top of themselves, potentially doubling efficiency. Systems with radioisotope generators simulated by electric heaters have demonstrated efficiencies of 20%, but have not yet been tested with radioisotopes. Some theoretical thermophotovoltaic cell designs have efficiencies up to 30%, but these have yet to be built or confirmed. Thermophotovoltaic cells and silicon TEMs degrade faster than metal TEMs, especially in the presence of ionizing radiation. Dynamic generators can provide power at more than four times the conversion efficiency of RTGs. NASA and DOE have been developing a next-generation radioisotope-fueled power source called the Stirling Radioisotope Generator (SRG) that uses free-piston Stirling engines coupled to linear alternators to convert heat to electricity. SRG prototypes demonstrated an average efficiency of 23%. Greater efficiency can be achieved by increasing the temperature ratio between the hot and cold ends of the generator. The use of non-contacting moving parts, non-degrading flexural bearings, and a lubrication-free and hermetically sealed environment have, in test units, demonstrated no appreciable degradation over years of operation. Experimental results demonstrate that an SRG could continue running for decades without maintenance. Vibration can be eliminated as a concern by implementation of dynamic balancing or use of dual-opposed piston movement. Potential applications of a Stirling radioisotope power system include exploration and science missions to deep-space, Mars, and the Moon. The increased efficiency of the SRG may be demonstrated by a theoretical comparison of thermodynamic properties, as follows. These calculations are simplified and do not account for the decay of thermal power input due to the long half-life of the radioisotopes used in these generators. The assumptions for this analysis include that both systems are operating at steady state under the conditions observed in experimental procedures (see table below for values used). Both generators can be simplified to heat engines to be able to compare their current efficiencies to their corresponding Carnot efficiencies. The system is assumed to be the components, apart from the heat source and heat sink. Where primes ( ' ) denote the time derivative. In which Theat sink is the external temperature (which has been measured to be 510 K for the MMRTG (Multi-Mission RTG) and 363 K for the SRG) and Theat source is the temperature of the MMRTG, assumed 823 K (1123 K for the SRG). This yields a Second Law efficiency of 14.46% for the MMRTG (or 41.37% for the SRG). RTGs pose a risk of radioactive contamination: if the container holding the fuel leaks, the radioactive material may contaminate the environment. For spacecraft, the main concern is that if an accident were to occur during launch or a subsequent passage of a spacecraft close to Earth, harmful material could be released into the atmosphere; therefore their use in spacecraft and elsewhere has attracted controversy. However, this event is not considered likely with current RTG cask designs. For instance, the environmental impact study for the Cassini–Huygens probe launched in 1997 estimated the probability of contamination accidents at various stages in the mission. The probability of an accident occurring which caused radioactive release from one or more of its 3 RTGs (or from its 129 radioisotope heater units) during the first 3.5 minutes following launch was estimated at 1 in 1,400; the chances of a release later in the ascent into orbit were 1 in 476; after that the likelihood of an accidental release fell off sharply to less than 1 in a million. If an accident which had the potential to cause contamination occurred during the launch phases (such as the spacecraft failing to reach orbit), the probability of contamination actually being caused by the RTGs was estimated at about 1 in 10. The launch was successful and Cassini–Huygens reached Saturn. To minimize the risk of the radioactive material being released, the fuel is stored in individual modular units with their own heat shielding. They are surrounded by a layer of iridium metal and encased in high-strength graphite blocks. These two materials are corrosion- and heat-resistant. Surrounding the graphite blocks is an aeroshell, designed to protect the entire assembly against the heat of reentering the Earth's atmosphere. The plutonium fuel is also stored in a ceramic form that is heat-resistant, minimising the risk of vaporization and aerosolization. The ceramic is also highly insoluble. Between 1961—2011, 28 U.S. space missions safely flew radioisotope energy sources. The plutonium-238 used in these RTGs has a half-life of 87.74 years, in contrast to the 24,110 year half-life of plutonium-239 used in nuclear weapons and reactors. A consequence of the shorter half-life is that plutonium-238 is about 275 times more radioactive than plutonium-239 (i.e. 17.3 curies (640 GBq)/g compared to 0.063 curies (2.3 GBq)/g). For instance, 3.6 kg of plutonium-238 undergoes the same number of radioactive decays per second as 1 tonne of plutonium-239. Since the morbidity of the two isotopes in terms of absorbed radioactivity is almost exactly the same, plutonium-238 is around 275 times more toxic by weight than plutonium-239. The alpha radiation emitted by either isotope will not penetrate the skin, but it can irradiate internal organs if plutonium is inhaled or ingested. Particularly at risk is the skeleton, the surface of which is likely to absorb the isotope, and the liver, where the isotope will collect and become concentrated. The first one was a launch failure on 21 April 1964 in which the U.S. Transit-5BN-3 navigation satellite failed to achieve orbit and burned up on re-entry north of Madagascar. The 17,000 Ci (630 TBq) plutonium metal fuel in its SNAP-9a RTG was injected into the atmosphere over the Southern Hemisphere where it burned up, and traces of plutonium-238 were detected in the area a few months later. This incident resulted in the NASA Safety Committee requiring intact reentry in future RTG launches, which in turn impacted the design of RTGs in the pipeline. 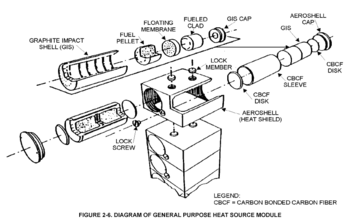 One innovative change was to transport the SNAP-27 heat source in a graphite cask on the moon lander leg and have an astronaut use a tool to remove it and insert it into the generator assembly. Alan Bean did this first on Apollo 12 with some difficulty when he didn't wait for the assembly to temperature-stabilize after removing the cask cover and the resulting friction between the SNAP-27 flange and the edge of the cask cavity prevented removal at first. The second was the Nimbus B-1 weather satellite whose launch vehicle was deliberately destroyed shortly after launch on 21 May 1968 because of erratic trajectory. Launched from the Vandenberg Air Force Base, its SNAP-19 RTG containing relatively inert plutonium dioxide was recovered intact from the seabed in the Santa Barbara Channel five months later and no environmental contamination was detected. The failure of the Apollo 13 mission in April 1970 meant that the Lunar Module reentered the atmosphere carrying an RTG and burned up over Fiji. It carried a SNAP-27 RTG containing 44,500 Ci (1,650 TBq) of plutonium dioxide in a graphite cask on the lander leg which survived reentry into the Earth's atmosphere intact, as it was designed to do, the trajectory being arranged so that it would plunge into 6–9 kilometers of water in the Tonga trench in the Pacific Ocean. The absence of plutonium-238 contamination in atmospheric and seawater sampling confirmed the assumption that the cask is intact on the seabed. The cask is expected to contain the fuel for at least 10 half-lives (i.e. 870 years). The US Department of Energy has conducted seawater tests and determined that the graphite casing, which was designed to withstand reentry, is stable and no release of plutonium should occur. Subsequent investigations have found no increase in the natural background radiation in the area. The Apollo 13 accident represents an extreme scenario because of the high re-entry velocities of the craft returning from cis-lunar space (the region between Earth's atmosphere and the Moon). This accident has served to validate the design of later-generation RTGs as highly safe. Mars 96 launched by Russia in 1996, but failed to leave Earth orbit, and re-entered the atmosphere a few hours later. The two RTGs onboard carried in total 200 g of plutonium and are assumed to have survived reentry as they were designed to do. They are thought to now lie somewhere in a northeast-southwest running oval 320 km long by 80 km wide which is centred 32 km east of Iquique, Chile. One RTG, the SNAP-19C, was lost near the top of Nanda Devi mountain in India in 1965 when it was stored in a rock formation near the top of the mountain in the face of a snowstorm before it could be installed to power a CIA remote automated station collecting telemetry from the Chinese rocket testing facility. The seven capsules were carried down the mountain onto a glacier by an avalanche and never recovered. It is most likely that they melted through the glacier and were pulverized, whereupon the 238plutonium zirconium alloy fuel oxidized soil particles that are moving in a plume under the glacier. The SNAP-27 heat source traveled to the moon in a graphite cask attached to the lander leg from which an astronaut removed it with a handling tool after a successful landing and placed it in the RTG. Many Beta-M RTGs produced by the Soviet Union to power lighthouses and beacons have become orphaned sources of radiation. Several of these units have been illegally dismantled for scrap metal (resulting in the complete exposure of the Sr-90 source), fallen into the ocean, or have defective shielding due to poor design or physical damage. The US Department of Defense cooperative threat reduction program has expressed concern that material from the Beta-M RTGs can be used by terrorists to construct a dirty bomb. RTGs and nuclear power reactors use very different nuclear reactions. Nuclear power reactors use controlled nuclear fission in a chain reaction. The rate of the reaction can be controlled with neutron absorbers, so power can be varied with demand or shut off entirely for maintenance. However, care is needed to avoid uncontrolled operation at dangerously high power levels. Chain reactions do not occur in RTGs, so heat is produced at an un-adjustable though steadily decreasing rate, that depends only on the amount of fuel isotope and its half-life. An accidental power excursion is impossible. However, if a launch or re-entry accident occurs and the fuel is dispersed, the combined power output of the radionuclides now set free does not drop. In an RTG, heat generation cannot be varied with demand or shut off when not needed. Therefore, auxiliary power supplies (such as rechargeable batteries) may be needed to meet peak demand, and adequate cooling must be provided at all times including the pre-launch and early flight phases of a space mission. Due to the shortage of plutonium-238, a new kind of RTG assisted by subcritical reactions has been proposed. In this kind of RTG, the alpha decay from the radioisotope is also used in alpha-neutron reactions with a suitable element such as beryllium. This way a long-lived neutron source is produced. Because the system is working with a criticality close to but less than 1, i.e. Keff < 1, a subcritical multiplication is achieved which increases the neutron background and produces energy from fission reactions. Although the number of fissions produced in the RTG is very small (making their gamma radiation negligible), because each fission reaction releases almost 30 times more energy than each alpha decay (200 MeV compared to 6 MeV), up to a 10% energy gain is attainable, which translates into a reduction of the 238Pu needed per mission. The idea was proposed to NASA in 2012 for the yearly NASA NSPIRE competition, which translated to Idaho National Laboratory at the Center for Space Nuclear Research (CSNR) in 2013 for studies of feasibility. [not in citation given]. However the essentials are unmodified. RTG have been proposed for use on realistic interstellar precursor missions and interstellar probes. An example of this is the Innovative Interstellar Explorer (2003–current) proposal from NASA. An RTG using 241Am was proposed for this type of mission in 2002. This could support mission extensions up to 1000 years on the interstellar probe, because the power output would decline more slowly over the long term than plutonium. Other isotopes for RTG were also examined in the study, looking at traits such as watt/gram, half-life, and decay products. An interstellar probe proposal from 1999 suggested using three advanced radioisotope power sources (ARPS). The RTG electricity can be used for powering scientific instruments and communication to Earth on the probes. One mission proposed using the electricity to power ion engines, calling this method radioisotope electric propulsion (REP). A power enhancement for radioisotope heat sources based on a self-induced electrostatic field has been proposed. According to the authors, enhancements of up to 10% could be attainable using beta sources. * The ASRG is not really an RTG: it uses a Stirling power device that runs on radioisotope (see Stirling radioisotope generator). ** The BES-5 Buk (БЭС-5) reactor was a fast breeder reactor which used thermocouples based on semiconductors to convert heat directly into electricity. *** The SNAP-10A used enriched uranium fuel, zirconium hydride as a moderator, liquid sodium potassium alloy coolant, and was activated or deactivated with beryllium reflectors. Reactor heat fed a thermoelectric conversion system for electrical production. Known spacecraft/nuclear power systems and their fate. Systems face a variety of fates, for example, Apollo's SNAP-27 were left on the Moon. Some other spacecraft also have small radioisotope heaters, for example each of the Mars Exploration Rovers have a 1 watt radioisotope heater. Spacecraft use different amounts of material, for example MSL Curiosity has 4.8 kg of plutonium-238 dioxide, while the Cassini spacecraft had 32.7 kg. ^ "Nuclear Battery-Thermocouple Type Summary Report" (PDF). United States Atomic Energy Commission (published 15 January 1962). 1 October 1960. ^ "General Safety Considerations" (pdf lecture notes). Fusion Technology Institute, University of Wisconsin–Madison. Spring 2000. p. 21. ^ a b c "Radioisotope Thermoelectric Generators". Bellona. 2 April 2005. Retrieved 13 June 2016. ^ "IAEA Bulletin Volume 48, No.1 – Remote Control: Decommissioning RTGs" (PDF). Malgorzata K. Sneve. Retrieved 30 March 2015. ^ "Report by Minister of Atomic Energy Alexander Rumyantsev at the IAEA conference "Security of Radioactive Sources," Vienna, Austria. March 11th 2003 (Internet Archive copy)" (PDF). Archived from the original (PDF) on 6 August 2003. Retrieved 10 October 2009. ^ "Nuclear pacemaker still energized after 34 years". 19 December 2007. Retrieved 14 March 2019. ^ a b NASA Doesn't Have Enough Nuclear Fuel For Its Deep Space Missions. Ethan Siegel, Forbes. 13 December 2018. ^ Plutonium supply for NASA missions faces long-term challenges. Jeff Foust. Space News, October 10, 2017. ^ a b Rod Adams, RTG Heat Sources: Two Proven Materials Archived 7 February 2012 at the Wayback Machine, 1 Sep 1996, Retrieved 20 Jan 2012. ^ "Polonium" (PDF). Argonne National Laboratory. Archived from the original (PDF) on 10 March 2012. ^ Nell Greenfield-Boyce, Plutonium Shortage Could Stall Space Exploration, NPR, 28 Sep 2009, retrieved 2 Nov 2010. ^ Dr Major S. Chahal, , UK Space Agency, 9 Feb 2012, retrieved 13 Nov 2014. ^ R.M. Ambrosi, et al. , Nuclear and Emerging Technologies for Space (2012), retrieved 23 Nov 2014. ^ "Voyager Mission Operations Status Reports". Voyager.jpl.nasa.gov web. Retrieved 24 July 2011. ^ "Spacecraft 'Nuclear Batteries' Could Get a Boost from New Materials". JPL News. Jet Propulsion Laboratory. 13 October 2016. Retrieved 19 October 2016. ^ "New Thermoelectric Materials and Devices for Terrestrial Power Generators" (PDF). Archived from the original (PDF) on 14 May 2013. Retrieved 7 May 2013. ^ "Top 10 Space Age Radiation Incidents". listverse.com. Retrieved 30 January 2018. ^ "NASA: Enabling Exploration: Small Radioisotope Power Systems". Sse.jpl.nasa.gov. Archived from the original on 28 September 2011. Retrieved 7 May 2013. ^ "Transit". Encyclopedia Astronautica. Retrieved 7 May 2013. ^ The RTGs were returned to Mound for disassembly and the 238PuO2 microsphere fuel recovered and reused. A. Angelo Jr. and D. Buden (1985). Space Nuclear Power. Krieger Publishing Company. ISBN 0-89464-000-3. ^ "Energy Resources for Space Missions". Space Safety Magazine. Retrieved 18 January 2014. ^ Arias, F. J. (2011). "Advanced Subcritical Assistance Radioisotope Thermoelectric Generator: An Imperative Solution for the Future of NASA Exploration". Journal of the British Interplanetary Society. 64: 314–318. Bibcode:2011JBIS...64..314A. ^ "Innovative Interstellar Probe". JHU/APL. Retrieved 22 October 2010. ^ "Interstellar Probe". NASA/JPL. 5 February 2002. Retrieved 22 October 2010. ^ Arias, Francisco J.; Parks, Geoffrey T. (November 2015). "Self-induced electrostatic-boosted radioisotope heat sources". Progress in Nuclear Energy. Elsevier. 85: 291–296. doi:10.1016/j.pnucene.2015.06.016. ISSN 0149-1970. ^ "SNAP-27". Smithsonian National Air and Space Museum. Archived from the original on 24 January 2012. Retrieved 13 September 2011. ^ a b c "SNAP Overview". USDOE ETEC. Archived from the original on 4 May 2010. Retrieved 4 April 2010. ^ Chitaykin, V.I; Meleta, Ye.A. ; Yarygin, V.I. ; Mikheyev, A.S.; Tulin, S.M. "Use of nuclear space technology of direct energy conversion for terrestrial application". International Atomic Energy Agency, Vienna (Austria). pp. 178–185. Retrieved 14 September 2011. ^ "Nuclear Reactors for Space". Retrieved 14 September 2011. ^ a b "Power Sources for Remote Arctic Applications" (PDF). Washington, DC: U.S. Congress, Office of Technology Assessment. June 1994. OTA-BP-ETI-129. ^ David M. Harland (2011). Apollo 12 - On the Ocean of Storms. Springer Science & Business Media. p. 269. ISBN 978-1-4419-7607-9. ^ "Mars Science Laboratory Launch Nuclear Safety" (PDF). NASA/JPL/DoE. 2 March 2011. Retrieved 28 November 2011. Wikimedia Commons has media related to Radioisotope thermoelectric generators. Idaho National Laboratory MMRTG page with photo-based "virtual tour"